Makaravillaku breaks up into Makara (a malayalam month) and villaku (lamp) literally translated means the lamp of the makara month. For centuries, Sabarimala in Pathanamthitta has been a major pilgrim centre in Kerala attracting thousands of devotees from all over India, more so from the southern states. The presiding deity is Lord Ayyappa known as Dharma Sastha, a considered symbol of unity between Vaishnavites and Saivites. According to legend he was born of the union of Lord Shiva and Lord Vishnu (in the form of Mohini) and is hence symbolic of the unity between Shaivites and Vaishnavites. The Makara Villaku Festival commemorates the day on which Lord Ayyappa was seated in the Sabarimala temple. The Mandal Puja Festival is a prelude to the MakaraVillaku Festival. The Sabarimala festival is celebrated during the months of November-January. 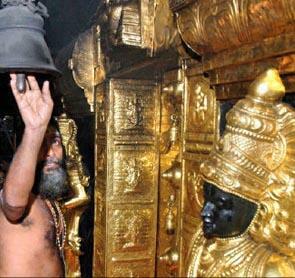 The Sabarimala temple festival of Kerala is celebrated in the honor of Lord Ayappa. Sabarimala is a renowned pilgrimage in Kerala and is famous all over the world. 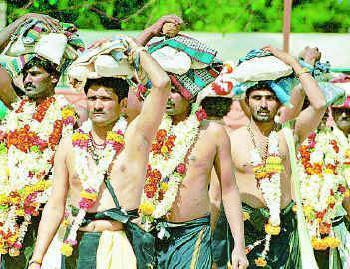 In Kerala, Sabarimala festival is attended by thousands of devotees who cover huge distances to reach the holy shrine. The Sabarimala temple is located atop a rugged hill in the Western Ghats. Since women (under the age of 50) are not allowed in the temple, the chiefly male devotees throng the temple in thousands. They walk barefoot through forests and uneven paths to reach the temple. All devotees follow a strict fast and devote themselves purely to God for 40 days before taking on the trip. They do not shave, eat selected food, stay away from vices like smoking and drinking, sleep on the floor, stay away from women and family and wear a black cloth around their waist as a symbol of going to the temple. While climbing, all devotees visiting the temple are supposed to carry an offering of coconuts, camphor, ghee and rice. On the way to the temple, there is a river where the devotees are supposed to take a dip. It is said that people who take a dip in this river while going to Sabarimala are cleansed of all their sins. Also, devotees are supposed to pay a visit to a temple dedicated to a Muslim God, who is supposed to be a close friend of Lord Ayappa. On the day of Makara Sankranti, a glowing speck of light is spotted on the hill just opposite the temple. This glowing flame is supposed to be very auspicious and devotees break into thunderous chanting of Lord's name on seeing this flame. The Sabarimala Festival includes the MakaraVillaku Festival and the Mandala Pooja Festival. The Mandala Pooja Festival, an important part of the Sabarimala Festival in Kerala begins 41 days before the auspicious day of Makar Sankranti. It continues for that period of 41 days at a stretch. The MakaraVillaku Pooja Festival, the most important part of the Sabarimala Festival in Kerala lasts for seven days. It commences on Makar Sankranti which is a very auspicious day of the Hindu calendar. On the seventh day of the MakaraVillaku festival, Guruthi is celebrated in which offerings are made to the lord. It is customary for no one to remain inside the temple after this day. Makar Sankranti also heralds the beginning of the Malayalam month of Makaram. On the evening of makara sankranthi, the makaravilakku/makara jyothi ( the light of kakara) is believed to be seen on the eastern horizon. This is possibly where the name Makara Villaku comes from. Thousands of pilgrims gather here to witness the event. On the evening of makara sankranthi, the makaravilakku/makara jyothi ( the light of kakara) is believed to be seen on the eastern horizon. Thousands of pilgrims gather here to witness the event. This is a festival that truly reflects the secular spirit of the state. Irrespective of caste, creed or color, people wear black dhotis and start the steep climb uphill. On the way, they even offer their prayers to Vavar, a Muslim deity. The name of the lord is continuously chanted (‘swami sharanam, ayaapa sharanam’) to reduce the strain of the tiring trek. The Sabarimala Festival in Kerala lasts from November (the start of fasting and abstinence) to January (the culmination of the pilgrimage).